The valuation field offers a dynamic career at the intersection of finance and accounting. You’ll work with leading companies making headlines and alongside the biggest names in wealth management and banking. Start learning the "language of business" from day one and look forward to unlimited opportunities to grow professionally and take your career where you want it to go. The Vanderbilt MAcc Valuation program prepares you to work in the valuation services line of public accounting firms, where all of this and more is possible. Valuation professionals ask complex questions: How do you determine the value of intellectual property? What is a brand name worth? How much should a company pay to purchase a competitor? These are just a few of the answers you will be seeking as a valuation associate. And today, demand for entry-level associates in this dynamic field is growing by double digits. At a public accounting and professional services firm, you will be part of a small, close-knit team providing specialized financial analyses and models that impact your clients’ business decisions on important matters such as strategy and acquisitions, asset management, restructuring and divestitures and management planning. 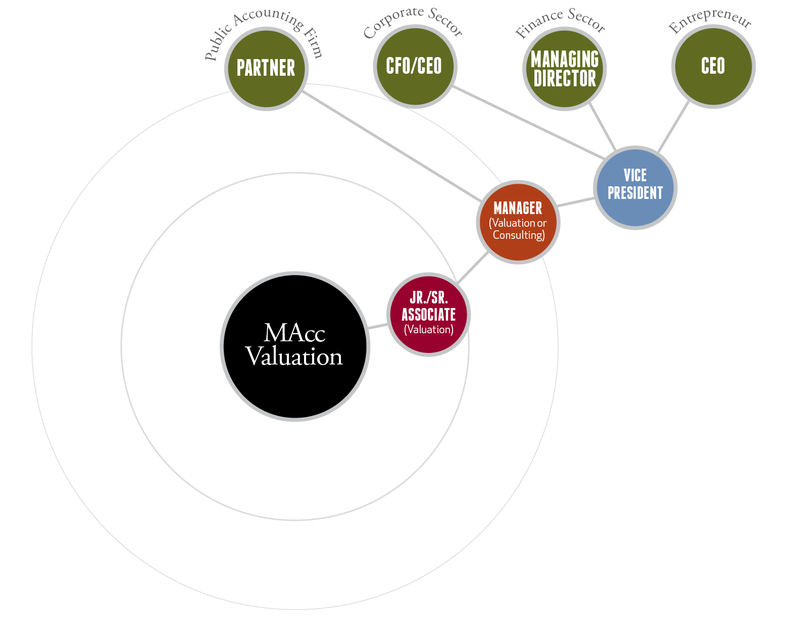 As a valuation professional at a leading global firm, you'll have unparalleled access to experts around the world, vast sources of data as well as the latest methodologies and tools. You’ll also have opportunities to observe and learn from client interactions, including providing support to the firm’s audit/assurance service line. Valuation associates tackle tasks such as financial statement analyses, due diligence on specific economic, industry and client company issues and documentation that supports the firm’s audit teams, as well as its clients. You’ll progress to conducting your own analyses and eventually, to overseeing and managing valuation projects as manager. The possibilities for your career advancement could include becoming a partner, CFO or CEO. To learn more about a career in valuation services, including sample projects and more, click here. Wondering how the job market and salary of an accountant compare to those of other business careers? US News & World Report recently ranked the job of accountant as #6 in the Best Business Jobs for 2017 list. Click here to read the full article. Vanderbilt's Master of Accountancy offers one degree with two distinct programs: MAcc Valuation and MAcc Assurance. Both are accelerated, all-inclusive programs that prepare you for positions with the world's largest (and most prestigious) accounting and professional services firms. Watch this video to learn more about career paths for MAcc Valuation and MAcc Assurance graduates. We consider your success fundamental to our program’s success. That’s why the Vanderbilt MAcc Valuation program provides you with personalized career consultation and preparation. We help you prepare for internship interviews, and we facilitate several firm-hosted interactions and school-sponsored events so you can learn more about your fit in this dynamic and rewarding profession. What do you need in the way of support? We know and are ready to provide it! Turn to the Vanderbilt MAcc team for everything you need to prepare for and excel in this exciting career! For more information about our partner firms, click here. an intern in the valuation field. Virtually all of our MAcc graduates choose to launch their careers with one of the Big 4 accounting and professional services firms—KPMG, Deloitte, PwC and EY.